The posters will be displayed near to the refreshments and exhibition. 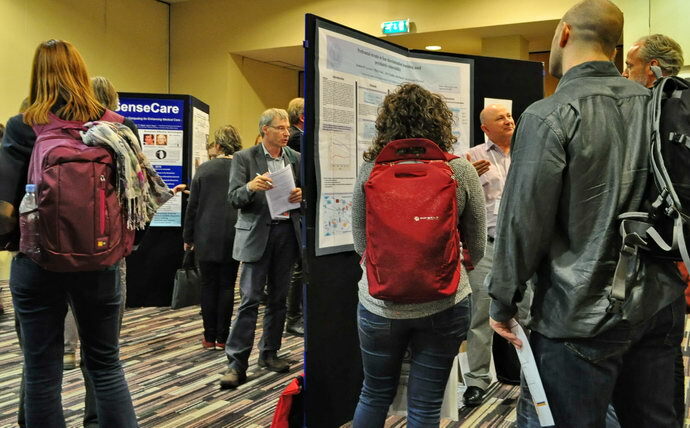 They will be on display for the entire conference, and authors will stand by their posters during the last hour of one of the lunch breaks to answer questions. You can download the schedule per day here. Your poster should fit onto an A0 board, portrait orientation and you will be able to mount your posters from 5 PM on the Tuesday. We will provide tape and/or pins and the board will be labelled with your poster number from EasyChair (listed in the above schedule). Posters are also eligible for prizes. This poster (Fast Development of Customized Rodent Behavior Recognition with Semi-Automated Labeling) has a web page including a video explaining how the tool works.